I don’t typically believe in setting New Year’s resolutions. They seem like a set-up for failure. I read somewhere that a huge percentage of people give up their resolutions within the first few weeks, and only a tiny percent actually stick with them through the year. It’s not hard to believe. People want to make big changes in their lives, but don’t realize it takes commitment, a plan, and actionable steps. Or they realize it, but aren’t willing to work for it. After all, we do seem to live in a world of instant gratification and wanting things now. That being said, when a new year rolls around, I can’t deny the pull of desire to attempt to create new habits and form fresh goals. I’m a goal setter by nature, so it makes sense for me to set yearly goals. To me, there are two keys to succeeding at my goals: 1) Being realistic, and 2) Breaking big goals into smaller, more manageable pieces. The less daunting they seem, the more likely I am to accomplish them, and I think that’s likely true for other people. January was a month I’m extremely proud of. I accomplished most of my goals, and worked hard to form new daily habits. Daily habits: I started a habit tracker in my bullet journal so I could get into the habit of doing certain things every day. This has worked with varying degrees of success before, but in January there were very few squares left blank, which makes me happy. A couple of the things I succeeded at every single day were having breakfast and doing my Duolingo French lessons. This is the first time I’ve ever hit a 31-day streak on Duolingo! A big thing I want to work at in 2018 is eating healthier (I have specific smaller goals for this, since ‘eat healthier’ is way too broad and vague and I think that’s part of why people don’t stick to it; it needs to be a lifestyle change if you’re really committed to it) and moving more. I ate more fruits and veggies in January than I did in the last several months combined. I’m not even kidding. I also made a conscious effort to reduce my sugar intake - less sweets, less sugar in my coffee, making sure to read labels to check for sugar content. I drank lots of water every single day, went 21 days without pop (considering I normally had pop almost every day, that’s huge for me), and cut back on alcohol. I also made a point to move every day and typically got at least half an hour of walking in, plus simply getting up from my desk and moving around more often. I didn’t set a number-related goal because I’ve done that too often and ended up disappointed, but I did lose almost 5 pounds and I’m thrilled with that. My biggest goal was to write my Christmas novella, Christmas Wish. The other day, I thought I’d have to mark this as a ‘failure’ in my January goals. The story was going to be a standalone sequel to my 2017 Christmas novella, Mistletoe Kiss. I got thinking about it, and I realized in a way I did hit my technical goal. When I first started writing, it was meant to be a 20,000-ish word Christmas novella. I planned to release it in November with a cover similar to Mistletoe Kiss so people knew they were a standalone series. But then I got writing and the story took on a mind of its own, and after awhile, I knew it wasn’t meant to be a novella. Bridget’s story was quick and sweet and fluffy - something to read during the holidays as a pick-me-up or to help people get into the holiday spirit. I thought Ivy’s story would have a similar feeling, but Ivy had different ideas and she took things in unexpected directions. I love when that happens, so I’m not complaining at all, especially since I’ve struggled with my writing for so long. I hit the 20,000-word mark on January 29th, so I technically reached my goal, even though Ivy’s story (now no longer ‘Christmas Wish’ and in need of a new title) isn’t finished. I’m proud of what I’ve accomplished and where the story is going, so I’ll definitely call this a win. Overall, I feel like I smashed my January goals. I didn’t get every single thing accomplished I’d hoped to, and I had days where I was frustrated or disappointed in myself, but on the whole, I’m proud of the things I managed to do. I’m feeling motivated and positive, and I’m going to do my best to keep the momentum going in February. I’d also like to do a few things I’ve been saying forever I was going to do like yoga and meditation. I want to live a more conscious, mindful, purposeful life, and I feel like meditation especially would help me focus and clear my mind (which would be nice since my mind feels like it’s going eleventy billion miles an hour most of the time). 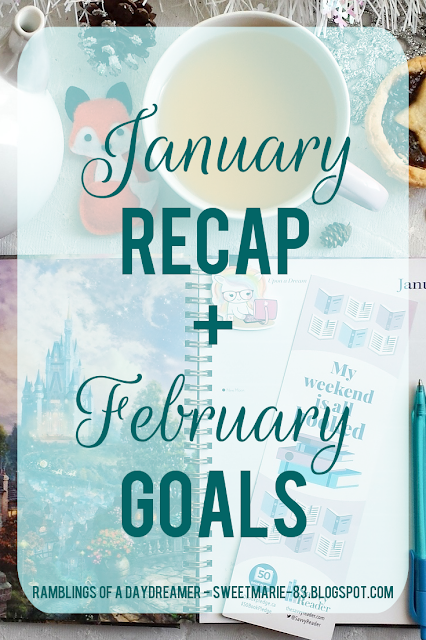 How did you do with your goals in January? 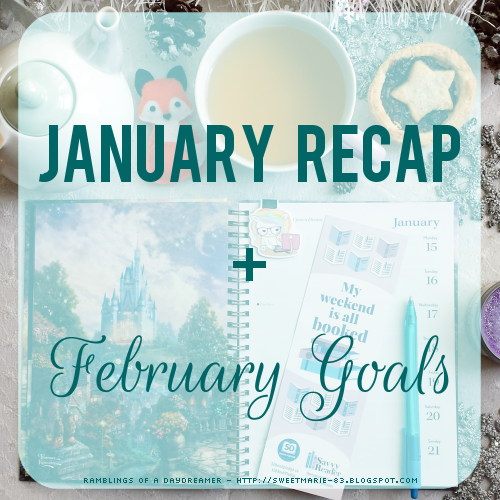 What are some of your goals for February? You did awesome! Congrats on smashing your goals. You did great! I would love to do all my resolutions in a second; however, that is not real. I hope you do as well and even better in February!